Whether you are refitting an entire kitchen or you’re planning a quick update, new kitchen taps offer a simple and effective way to refresh the kitchen. The variety of styles and finishes now available means there is great choice for both traditional and contemporary kitchens. When selecting new kitchen taps, quality and durability are highly important as it is a hardworking piece of equipment. A kitchen tap should be simple to use and designed to suit all purposes whilst combining sleek style. This guide informs you of the various factors that you need to consider when buying a new kitchen tap, from the aesthetics to the practical requirements. Pillar taps are supplied as a pair. Each tap functions independently from one another, so one will control cold water and the other will control hot water. Mixer taps are available in Monobloc styles, which features one or two handles and is mounted on an individual stand. Mixer taps are also available as a Deck mixer which features a single spout but uses two tap-holes. These taps often feature a convenient high spout for ease of use and a swivel mechanism for more control over the direction of water. This is also a useful feature if you opt for a 1.5 or 2 bowl sink. Spray mixer taps provide stylish functionality as this type of kitchen tap features a pull-out spout, making it highly useful for a variety of domestic needs. Adding a sense of professionalism to a kitchen these spray taps provide an ideal combination of design and practicality. Their ability to reach beyond the kitchen sink makes them perfect for household jobs as you have greater control over the water flow. Kitchen fixtures are often offered in classic chrome or stainless steel finishes. The finish of your tap depends entirely on the style of your kitchen as a whole. Stainless steel in either a polished or brushed finish offers a timeless addition to the kitchen that will appeal to any homeowner. Unconventional colours have increased in demand recently as rose gold and matt black taps have dominated in kitchen interior design. 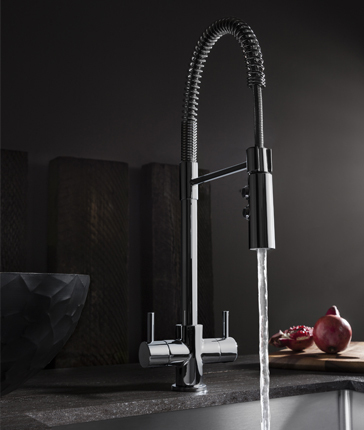 If you were considering making a design statement, black taps are the perfect solution for a more contemporary kitchen. When selecting a new tap for your kitchen, choose one that is compatible with your water pressure; this means you’ll get the best performance from your kitchen tap. A high or low pressure water system will determine your choice of kitchen taps. Be sure to select a designed to operate effectively for you needed pressure. Why not take advantage of our amazing 15% off the entire Francis Pegler range. Specialising in both kitchen and bathroom taps, Francis Pegler offer high quality finish and hard working equipment as standard. Treat yourself before Christmas as this offer ends 1st December! What is a Combi Boiler and Why are They so Popular?